In the world of Orleans, everyone is born with grey skin and hair. 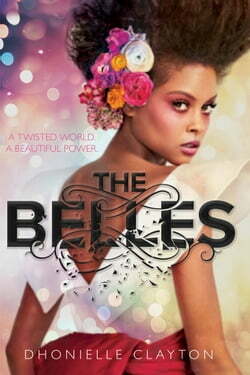 The belles, a group of magical, goddess-like girls, can turn anyone beautiful. A belle’s only purpose is to manipulate appearances; they are forbidden to fall in love and die at a young age. The people of Orleans travel far and... read more wide to seek their help, but beauty comes at a price only the rich and powerful can afford. At the annual ceremony where belles show off their skills, sixteen-year-old Camille is chosen as Le Favori, the favorite. She is summoned to join the royal court as Princess Marie’s personal belle. But beneath the lavish balls and luxurious lifestyle, Camille begins to discover a world of cruelty, secrets and lies. Marie turns out to be a vicious, power hungry young royal and demands to use Camille’s magic for evil. Desperate for help, Camille turns to a headstrong boy named Auguste and begins to develop feelings for him. The trouble is, Auguste is Marie’s husband-to-be. Amidst her fledgling clandestine romance and coping with Marie’s evil ways, Camille also starts to unravel the history of the belles—where they really come from and how she alone is different than any other beautiful belle.